2. Wash, trim, and slice or cube zucchini. 3. Wash, peel, and rewash carrots. Slice or dice. 4. Husk corn, remove silk, and wash. Blanch 3 minutes in boiling water. Cut corn from cob at about three-fourths the depth of kernel. Caution: Do not scrape cob. 5. Shell lima beans and wash thoroughly. 6. Wash green beans and trim ends. Leave whole or cut or snap into 1-inch pieces. 7. Wash tomatoes. Dip in boiling water for 30 to 60 seconds or until skins split; then dip in cold water. Slip off skins and remove cores. Leave whole or crush. 8. Combine all vegetables in a large pot or kettle, and add enough water to cover pieces. 9. Add 1 teaspoon salt per quart to each jar, if desired. 10. Boil 5 minutes and fill jars with hot pieces and liquid, leaving 1-inch headspace. 11. Remove air bubbles and adjust headspace if needed. 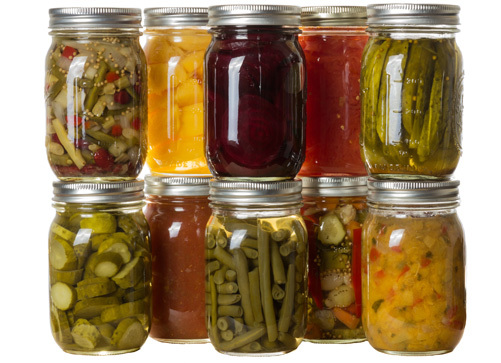 Wipe rims of jars with a dampened clean paper towel; apply two-piece metal canning lids. 12. process in a pressure canner according to the recommendations. Let cool, undisturbed, 12-24 hours and check for seals.